Acura is the luxury vehicle marque of Japanese automaker Honda. The brand was launched in the United States and Canada in March 1986, marketing luxury, performance, and high-performance vehicles. It was introduced to Hong Kong in 1991, Mexico in 2004, China in 2006, Russia in 2014 and Kuwait in 2015, and is also sold in Ukraine. Honda's plan to introduce Acura to the Japanese domestic market (JDM) in 2008 was delayed, due to economic reasons, and later withheld as a result of the 2008 financial crisis. Acura holds the distinction of being the first Japanese automotive luxury brand. The creation of Acura coincided with the introduction of a JDM Honda dealership sales channel, called Honda Clio, which sold luxury vehicles, joining previously established Honda Verno, followed by Honda Primo the following year. In its first few years of existence, Acura was among the best-selling luxury marques in the US. Though sales were down in the mid-to-late 1990s, the brand experienced a revival in the early 2000s, due to drastic redesigns and the introductions of new models. In the late 1980s, the success of the company's first flagship vehicle, the Legend, inspired fellow Japanese automakers Toyota and Nissan to launch their own luxury brands, Lexus and Infiniti, respectively. The 1990 launch of the NSX, a mid-engine exotic sports car, offered a reliable and practical alternative to exotic European sports cars, and introduced Honda's VTEC variable valve timing system to the North American market. The 1993 Legend coupé featured Honda's first use of a six-speed manual transmission, mated to a Type II engine. In the late 1990s, Acura produced a Type R version of its compact Integra coupé, which featured a reduced curb weight, a stiffer and lower suspension, and a high-output VTEC engine. In the early 2000s, Acura introduced new models, including the company's first all-original SUV, the MDX, and two models which replaced the Integra coupé and sedan, the RSX and TSX, respectively. Type-S versions of the RSX, CL, and TL were added to the brand's lineup during that decade. Acura's 2005 RL flagship introduced SH-AWD, a torque-vectoring all-wheel drive system. The 2007 RDX, a crossover SUV, featured the first North American use of a turbocharged Honda engine. In the 2010s, Acura debuted more new models, including the ILX, TLX, and RLX, the latter of which introduced Acura's Jewel Eye LED headlights. A second generation NSX was launched in 2015 and features a twin-turbocharged mid-engine, a nine-speed dual-clutch transmission, and Sport Hybrid SH-AWD. Adidas AG (German pronunciation: [ˈadiˌdas]) (stylised as adidas since 1949) is a German multinational corporation, headquartered in Herzogenaurach, Bavaria, that designs and manufactures shoes, clothing and accessories. It is the largest sportswear manufacturer in Europe, and the second largest in the world. It is the holding company for the Adidas Group, which consists of the Reebok sportswear company, TaylorMade-Adidas golf company (including Ashworth), 8.33% of Bayern Munich and Runtastic, an Austrian fitness technology company. Adidas revenue for 2016 was listed at €19.29 billion. Adidas was registered on 18 August 1949 by Adolf Dassler, following a family feud at the Gebrüder Dassler Schuhfabrik company between him and his older brother Rudolf. Rudolf had earlier established Puma, which quickly became the business rival of Adidas, and is also headquartered in Herzogenaurach. The company's clothing and shoe designs typically feature three parallel bars, and the same motif is incorporated into Adidas's current official logo. The brand name is uncapitalized and is stylized with a lower case "a". Licensed under Creative Commons Attribution-Share Alike 4.0 (Biodin). Amazon.com, Inc., doing business as Amazon (), is a multinational technology company focusing in e-commerce, cloud computing, and artificial intelligence in Seattle, Washington. Amazon is the largest e-commerce marketplace and cloud computing platform in the world as measured by revenue and market capitalization. Amazon.com was founded by Jeff Bezos on July 5, 1994, and started as an online bookstore but later diversified to sell video downloads/streaming, MP3 downloads/streaming, audiobook downloads/streaming, software, video games, electronics, apparel, furniture, food, toys, and jewelry. The company also owns a publishing arm, Amazon Publishing, a film and television studio, Amazon Studios, produces consumer electronics lines including Kindle e-readers, Fire tablets, Fire TV, and Echo devices, and is the world's largest provider of cloud infrastructure services (IaaS and PaaS) through its AWS subsidiary. Amazon has separate retail websites for some countries and also offers international shipping of some of its products to certain other countries. 100 million people subscribe to Amazon Prime.Amazon is the largest Internet company by revenue in the world and the second largest employer in the United States. In 2015, Amazon surpassed Walmart as the most valuable retailer in the United States by market capitalization. In 2017, Amazon acquired Whole Foods Market for $13.4 billion, which vastly increased Amazon's presence as a brick-and-mortar retailer. The acquisition was interpreted by some as a direct attempt to challenge Walmart's traditional retail stores. Licensed under Creative Commons Attribution-Share Alike 3.0 (Joe Ravi). Apple Inc. is an American multinational technology company headquartered in Cupertino, California that designs, develops, and sells consumer electronics, computer software, and online services. The company's hardware products include the iPhone smartphone, the iPad tablet computer, the Mac personal computer, the iPod portable media player, the Apple Watch smartwatch, the Apple TV digital media player, and the HomePod smart speaker. Apple's consumer software includes the macOS and iOS operating systems, the iTunes media player, the Safari web browser, and the iLife and iWork creativity and productivity suites. Its online services include the iTunes Store, the iOS App Store and Mac App Store, Apple Music, and iCloud. Apple was founded by Steve Jobs, Steve Wozniak, and Ronald Wayne in April 1976 to develop and sell Wozniak's Apple I personal computer. It was incorporated as Apple Computer, Inc. in January 1977, and sales of its computers, including the Apple II, saw significant momentum and revenue growth for the company. Within a few years, Jobs and Wozniak had hired a staff of computer designers and had a production line. Apple went public in 1980 to instant financial success. Over the next few years, Apple shipped new computers featuring innovative graphical user interfaces, and Apple's marketing commercials for its products received widespread critical acclaim. However, the high price tag of its products and limited software titles caused problems, as did power struggles between executives at the company. Jobs resigned from Apple and created his own company. As the market for personal computers increased, Apple's computers saw diminishing sales due to lower-priced products from competitors, in particular those offered with the Microsoft Windows operating system. More executive job shuffles happened at Apple until then-CEO Gil Amelio in 1997 decided to buy Jobs' company to bring him back. Jobs regained position as CEO, and began a process to rebuild Apple's status, which included opening Apple's own retail stores in 2001, making numerous acquisitions of software companies to create a portfolio of software titles, and changed some of the hardware technology used in its computers. It again saw success and returned to profitability. In January 2007, Jobs announced that Apple Computer, Inc. would be renamed Apple Inc. to reflect its shifted focus toward consumer electronics and announced the iPhone, which saw critical acclaim and significant financial success. In August 2011, Jobs resigned as CEO due to health complications, and Tim Cook became the new CEO. Two months later, Jobs died, marking the end of an era for the company. Apple is the world's largest information technology company by revenue and the world's third-largest mobile phone manufacturer after Samsung and Huawei. In February 2015, Apple became the first U.S. company to be valued at over US$700 billion. The company employs 123,000 full-time employees as of September 2017 and maintains 500 retail stores in 22 countries as of December 2017. It operates the iTunes Store, which is the world's largest music retailer. As of January 2016, more than one billion Apple products are actively in use worldwide. Apple's worldwide annual revenue totaled $229 billion for the 2017 fiscal year. The company enjoys a high level of brand loyalty and has been repeatedly ranked as the world's most valuable brand. However, it receives significant criticism regarding the labor practices of its contractors and its environmental and business practices, including the origins of source materials. Licensed under Creative Commons Attribution-Share Alike 3.0 (Hansueli Krapf). 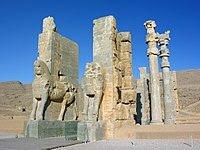 Arash the Archer (Persian: آرش کمانگیر‎‎ Āraŝ-e Kamāngīr) is a heroic archer-figure of Iranian mythology.